The other night, I went to a birthday party that ended with a horse-drawn carriage ride under a full moon. Despite freezing temperatures, my children, our little dog, and I felt warm under doubled over wool blankets. The clip-clop of horse hooves and the crisp night air lulled me into relaxation. Out the back of our covered wagon, I watched the moonlit, mountainous landscape pass by, noticing every roadside tree, rock, and snow measuring stick. Soon, the three-year old child sitting opposite me, fell asleep, her little body nestled at her father's side. As we moved through the wild, mostly uninhabited region behind Lauenen, I thought of my grandfather who had grown up there. I remembered the stories he had told me, including his witnessing the first motorcar to roll into the village. My grandfather died at 95, never driving a car. Yes, he walked a lot. The weather this past month has been so glorious that my stone wall/terrace project took most of my attention. 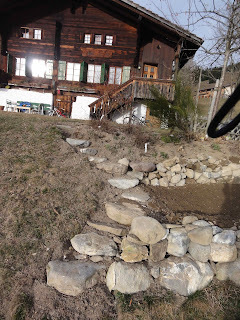 Finding a balance between outdoor and indoor projects is a challenge living in the Swiss Alps. As you can see, I am more or less finished and just need to find a few more rocks to cap off the tops. Next, I will plant some sun loving plants. Any suggestions? Is there such a thing: warm and attractive pajamas? Scouring the web to find plain white flannel pajamas without silly bear motifs or goofy pink bunny patterns, I have come up empty handed. In an effort to save energy, I've been gradually turning down thermostats. We're down to 16C (60.8F) at night. My goal is 13C-14C (55.4-57.2F). The nuclear catastrophe in Japan is reminding me that although we are lucky to be living in a time and place of plenty, things might not always stay like that. Thriftiness doesn't have to mean inferior quality. On the contrary. How well I slept during my childhood holidays spent at my grandparents' chalet in the Swiss Alps! Under layers of thick cotton sheets, wool blankets, and a huge puffy down comforter, I roasted even though the room was frigid. My sinuses felt great, my skin remained soft, and I felt truly rested upon waking.